When you are discussing horror movies, it is a safe bet that before you get deep into the conversation, Sam Raimi’s “Evil Dead” trilogy will come up. 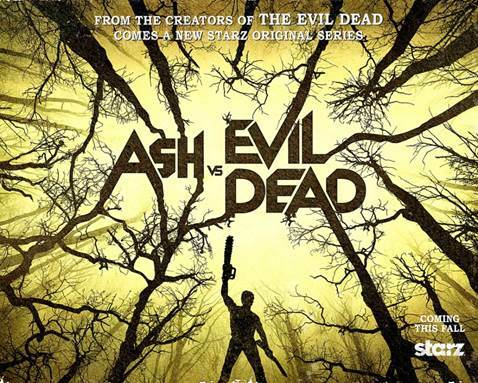 The cult film series has inspired countless horror films, has one of the most rabid fan bases around and is about as timeless as any piece of art—so there is no shock here when it was announced that Raimi would be expanding the “Evil Dead” universe with a new STARZ original series “Ash vs Evil Dead” with Bruce Campbell returning as Ash Williams, the character that made him a cult icon. Now, anyone who has seen “Army of Darkness” knows that time travel plays a factor in the series—so who knows how the events of that film has affected the universe, I guess we will have to wait and see to find out. This is almost a given with it being a 10 episode season, which covers more ground than the three films—but how exciting is it to hear that even after three films and a remake that the “Evil Dead” universe will be able to shock and surprise. Like Mr. Campbell stated, fans of the “Evil Dead” do not want stepped on stuff. One of pillars of the franchise is its ability to go 0-100 real quick with the gore and STARZ has proven with shows like “Spartacus” that they are willing to go there. This is refreshing considering the remake was successful both critically and commercially, which is always a recipe for a sequel. Alvarez delivered a movie that was both new and gave the fans something in line with what made the original “Evil Dead” such a fixture in horror. The “Evil Dead” is known for the gore and comedy; Campbell anchored the films with his performance. Even with the success of the “Evil Dead” remake, fans kept clamoring for the return of Ash—of not just the character, but Bruce Campbell in the role. With a premium cable series, true fans and newcomers can marvel in the joy of Campbell’s performance as Ash. Given all this, how excited are you for “Ash vs Evil Dead”? The series is set to premiere on STARZ this fall. Keep it locked for more. NXT Coverage: Ole or KO?